You know how sometimes you just want to eat something quick and easy? For example, even though that expertly grilled medium rare sirloin steak is some of the most delicious, tender and tasty beef available, sometimes a cheeseburger from McDonald’s is just what the doctor ordered (well, probably not my doctor, but you know what I mean)! Instant ramen are like the cheap and cheerful cheeseburger of the noodle world. Quick and easy to prepare, suitably satisfying for our taste buds and never too expensive. Real ramen from an authetic Japanese ramen bar are also suitably delicious, but that is where the similarities end! Read on and find out why everyone at Japan Centre can’t get enough of the amazing taste of lovingly prepared, high quality ramen noodles! Ramen came to Japan from China, but nobody really knows exactly when. It is speculated that the word ramen comes from the Chinese lamian, which means hand-pulled noodles. Indeed, even today the word ramen is usually written in Katakana, the alphabet used in Japanese for foreign loanwords, indicating that they are not of Japanese origin. Although various forms of ramen had existed before, it was after the second world war, when many Japanese returned home after being stationed in China, that ramen really took off. Not only were these men now familiar with the ingredients used in Chinese cuisine, but cheap flour was being imported from the US, which made it easier than ever to make noodles. Ramen bars exploded in popularity all over the country, but it was still a time when people went out to eat ramen rather than eating them at home. That was of course until 1958, when a Taiwanese-Japanese businessman named Momofuku Ando perfected the first instant ramen. Using a newly developed method of flash frying noodles so that they could be packaged pre-cooked and later prepared with just boiling water, he created a sensation. So big was this creation, that instant ramen were named as the most important Japanese invention of the 20th century! Ando used his newly created Nissin company to start selling Chicken Ramen, the very first instant noodles, and the rest was… well, history! The very first instant noodles: Chicken Ramen from Nissin Foods. The phrase reads “Instantly delicious, serious deliciousness”! A ramen dish can be broken down into two components: the actual noodles, and the soup or broth which accompanies them. The noodles are made from wheat flour, salt, water and a mineral water containing sodium carbonate and potassium carbonate which gives them a firm texture. 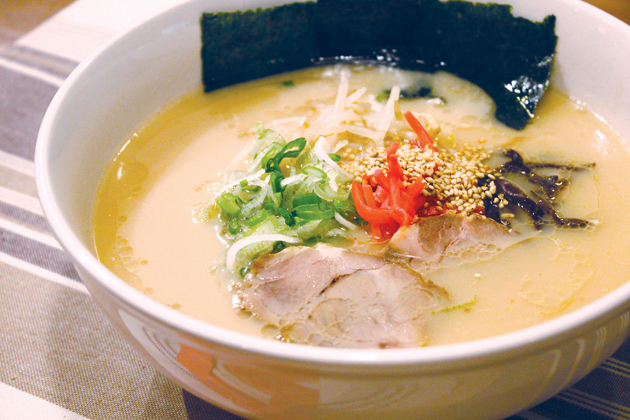 However, when it comes to ramen, the soup is usually the main event! A salt based soup is a standard soup base made from salt (of course), and usually combined with a chicken or vegetable stock. The soup is lightly flavoured with a clear appearance and often has additional ingredients such as bbq pork meat, fish paste kamaboko or even pickled plums called umeboshi. Ramen noodle soup made from soy sauce is a popular choice, particularly on the main Island on Honshu and in and around Tokyo. It is made with a chicken stock and lots of soy sauce to give it a rich, tangy taste. Common toppings include nori seaweed, boiled egg, sliced spring onions and marinated bamboo shoots. Although miso soup has existed for generations, only recently has it become a soup to compliment noodles. It was developed in Hokkaido in the cold, northern areas of Japan and has a very rich, home-cooking style flavour made with miso paste and chicken stock. Chunky vegetables are the most common toppings for miso ramen. Tonkotsu means pork bone in Japanese and although sounding similar to tonkatsu (pork cutlet), it is quite different. Tonkotsu is made by boiling pork bones and fat for a considerable time to infuse the soup with a serious pork flavour and to create a thick, almost creamy texture that is delicious and filling. The most popular toppings are bbq pork slices, pickled red ginger and other vegetables. Tonkotsu ramen are originally from Kyushu, Japan’s most southern main island and are sometimes called Hakata ramen from the city where they originated. Tonkotsu Ramen, a Hakata, Kyushu specialty. Now available at Japan Centre Regent Street, umai deli and toku restaurant. Ramen have a bit of a bad reputation in the West. Our friend Mr Ando from Nissin Foods helped to set up a subsidiary of Nissin Foods for the American market in the early 1970’s to push his new instant ramen to a global audience. This was certainly successful, but also started the preconception that ramen are a type of fast food, unhealthy and incapable of providing any sort of nutrition. For instant ramen, this preconception is not entirely unfounded. Instant ramen are created by deep frying the noodles in palm oil before drying them out for packaging, which means they admittedly don’t really offer much nutritional benefit. However, the main problem comes from the artificial ingredients and huge amounts of salt found in the powdered soup base. As delicious as they are, instant ramen should be enjoyed, as they say, “as part of a balanced diet”. Real ramen noodles from a quality Japanese noodle bar are typically made with natural ingredients. So while they too cannot be classed as a healthy dish, they certainly aren’t quite as bad for you as instant ramen as they also typically contain a variety of fresh vegetables and seaweed. However, the quality between these two dishes is incredible. Let’s go back to our burger analogy from before. Instant ramen are the quick and easy cheeseburgers from McDonalds, and a quality bowl of ramen is like a giant tenderloin steak cooked exactly to your liking by Gordon Ramsay, while simultaneously receiving a shiatsu massage and being serenaded by the smooth tones of Stevie Wonder! I know which one I would rather choose! Where to Get Ramen Noodles? Instant ramen noodles can be found everywhere these day, including Japan Centre, where you can currently find over 50 different types of instant noodles available to buy online. We also have a Ramen Lovers Kit which includes a bowl, spoon and a selection of ramen to get you on your way! Even major supermarkets have a good selection of ramen in stock these days, even when excluding generic noodly items such as Batchelor’s Super Noodles. However, what if you want to experience the taste of truly authentic Japanese style ramen noodles? Besides actually travelling all the way to Japan just for lunch, your best option is to find an authentic ramen bar that has quality ramen noodles available. Of course, if you want to make it really easy, why not just come to Japan Centre in Regent Street where you can find a wonderful selection of all types of authentic ramen at the umai deli and toku restaurant starting from just £6.10. Absolutely, that is the main event! Using authentic ingredients shipped directly from Kyushu, our tonkotsu ramen at umai and toku restaurant is the pinnacle of real authentic Japanese ramen. 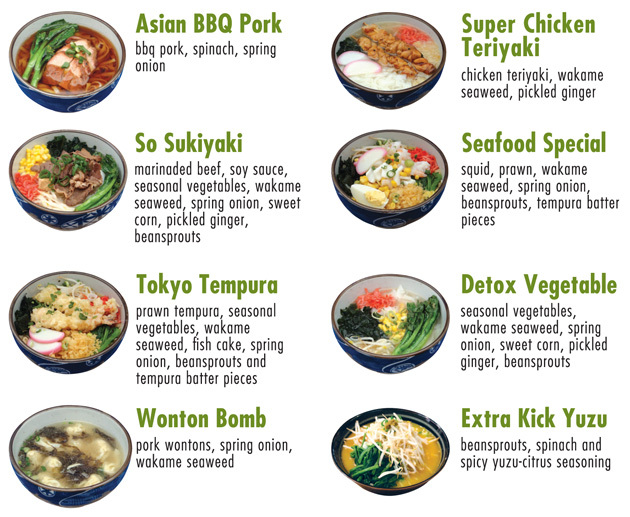 With such a wide choice of ramen available, there has never been a better time to come and see what all the fuss is about! Posted in Food and tagged Hakata, Kyushu, miso, Noodles, Ramen, Shio, Tonkotsu. Bookmark the permalink.